There is no better time to give to someone in need than today! THIS APRIL Be a part of giving 1,500 backpacks to 1,500 Internally Displaced Children in Nigeria for N1,500 per child! I have been involved in helping an IDP Camp in Benin City, Nigeria and several IDP Camps around the country for the last several years. Sometimes, my donors and I have a lot to give sometimes we have a little, but the key is that we keep giving. The April IDP Challenge is to help us provide school backpacks for the 1,500 children in the camp here in Benin City. Recently, the Edo State Government built and commissioned a state of the art school for the children with the promise of building additional structures and donating text books. I was blessed to be a part of that project and to be able to be there for the commissioning. Together, we can help to make these diligent students feel dignified as they attend classes in their new facility. All participants are to take a picture or make a one minute video on INSTAGRAM or TWITTER stating their donation (#1, 500 and above) holding up a plain sheet of paper with the hashtag #iEducateIDP with #LauriesIDPChallenge. Please tag @IdahosaLaurie when you post. Tag the 2 people you nominate to join you in the challenge. Nominated persons have 24 hours to comply by nominating 2 others or forfeit. Those who wish to donate from outside of Nigeria or in foreign currency should do so through http://jesusexperience.com and give through the link for Nigeria Refugee Aid. 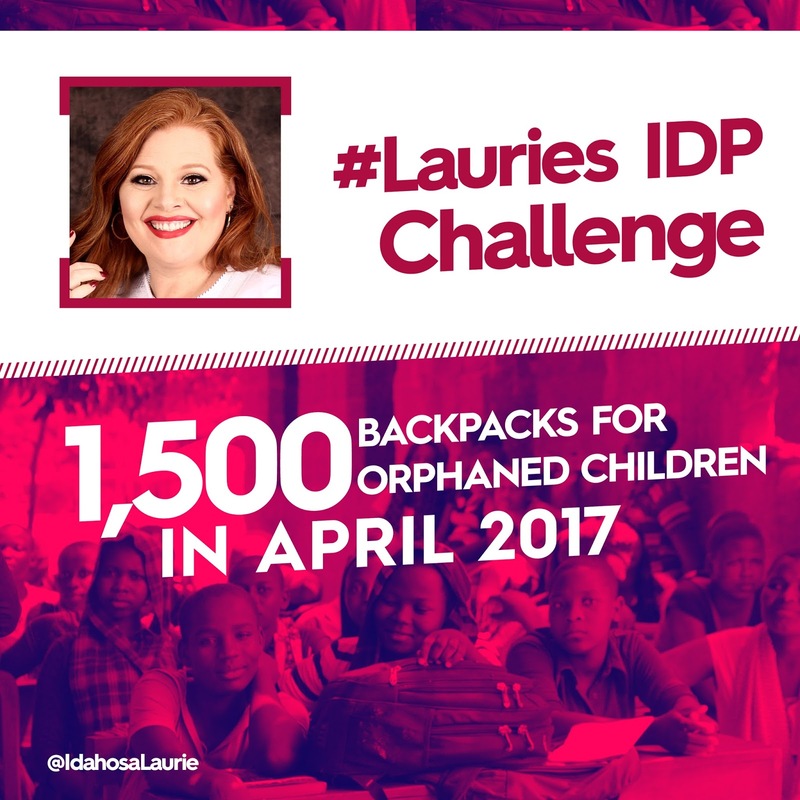 Our Vision for this Challenge is that during the month of April 2017 we will be able to provide 1,500 backpacks for 1,500 Internally Displaced Children. We encourage participants in this program to sponsor at least one student and to consider doing more as you are able. Should more money be donated than the target of N2,250,000, we will be able to fill backpacks with school supplies and necessities for these same children. Should you have items that you wish to donate in addition to the funds for the backpack, they are highly welcomed. Corporate Sponsors are also welcome. We encourage individuals, families, businesses, civic associations, NGOs, student groups, churches, etc. to be a part of this Challenge. Let's bond together and challenge each other to make a difference. We will update this blog and my social media handles @IdahosaLaurie with the progress being made towards our plan to put a smile on these children's faces. We keep transparent records and 100% of the money being donated goes to the children. There are no administrative or overhead costs attached to #LauriesIDPChallenge. Everyone who is a part of it is a volunteer. Our records are available should you wish to see how the funds are used. Should you desire to visit the camp with us on the day that we present the backpacks, you are highly welcome. Details on the date of outreach will follow in subsequent posts. Please indicate interest in the comment section below. #iEducateIDPs will officially end on April 30, 2017, however, donations are always welcome for the children and gifts received after the closing date will be used for their welfare. Thank you very much for your generosity. God bless you.